While it’s completely invisible and only a single atom thick, graphene is the lightest, strongest, most conductive material ever discovered, and has the same potential to change life on Earth as stone, bronze and iron once did. But it remains difficult to work with, extremely expensive to produce at scale, and lives mostly in pioneering research labs. 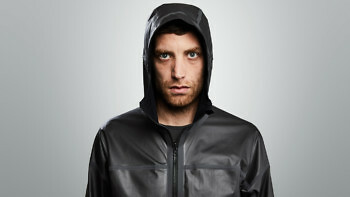 So following in the footsteps of the scientists who discovered it through their own highly speculative experiments, we’re releasing graphene-coated jackets into the world as experimental prototypes. Our aim is to open up our R&D and accelerate discovery by getting graphene out of the lab and into the field so that we can harness the collective power of early adopters as a test group. 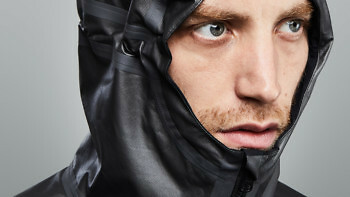 No-one yet knows the true limits of what graphene can do, so the first edition of the Graphene Jacket is fully reversible with one side coated in graphene and the other side not. Sign up to get advance access to the next edition of the Graphene Jacket and other new releases. 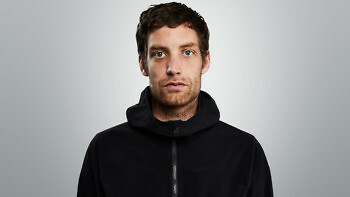 We shot the Graphene Jacket on climber, surfer and snowboarder James Jagger, who is 6ft 1 / 185cm and wearing size medium. The jacket fits true to size. The fit is more like a lightweight running jacket than a bulky ski shell and is similar in size to our Solar Charged Jacket. 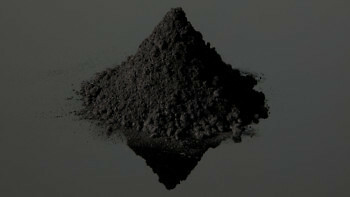 Graphene is simply the thinnest possible layer of graphite, the stuff used to make pencils. When graphite is reduced to a single layer of carbon atoms arranged in a hexagon formation, it turns into a supermaterial unlike anything ever known before – it’s so strong and so stretchy that the fibres of a spider web coated in graphene could catch a falling plane. With the potential to transform almost every industry from space travel to electronics, graphene is so mind-blowing that its discovery was described as like finding CERN’s Large Hadron Collider on your desk. Part jacket. Part science experiment. Following in Geim and Novoselovs’ Nobel Prize-winning footsteps, we’re releasing graphene-coated jackets into the world as experimental prototypes. The original discovery came from an open-ended research project whose outcomes were impossible to predict, so we’re continuing in that vein. Knowing that the only thing that will ultimately limit what can be done with graphene is our collective imagination, the next logical step for us is getting graphene out into the hands of early adopters to see what happens. It’s hard to experiment with something that only behaves one way, so we made the jacket fully reversible, so there is no inside or outside. 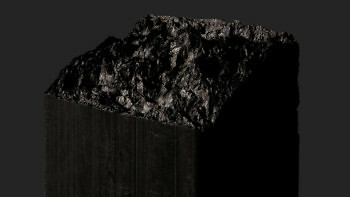 One side is coated entirely in graphene. The other isn’t. The graphene side looks gun-metal grey. 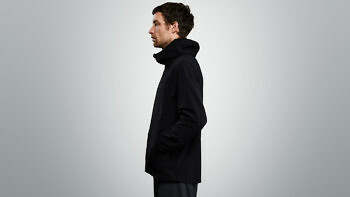 The non-graphene side is matt black and made from high-strength, high-stretch nylon. Depending on which way around you wear it and what you do in it, the jacket will interact with your body and the world around it in a series of different ways. 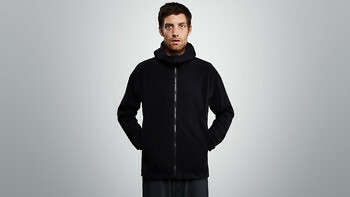 The first step to creating this jacket involves turning raw graphite into graphene nanoplatelets. These small stacks of graphene are blended with polyurethane to create an incredibly thin membrane, which is then bonded to nylon to create an entirely new material. Adding graphene to the nylon fundamentally changes its mechanical and chemical properties – a nylon fabric that couldn’t naturally conduct heat or energy for instance, now can. And as graphene is only one atom thick, you can do this without adding a single gram of weight. Starting with the basics, because the jacket is reversible the pockets are too. As experimental as it is, you still need to be able to wear it. So the pockets work whichever way round you’ve got it on. 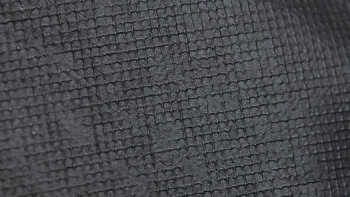 Every panel of the Graphene Jacket is cut with lasers - the material is so expensive wasting it is not an option. 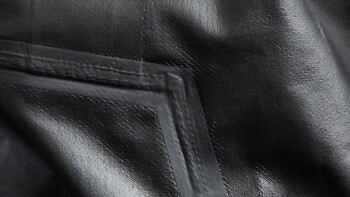 And both pockets are laser cut with such precision that we’ve been able to leave the edges raw with zero stitching. All the panels are then bonded together and the seams sealed for waterproofness. One of our first prototypes of the Graphene Jacket was so highly conductive you could attach a power source at one end, a light bulb at the other and it would light up. Having debated how useful or dangerous that would be, we decided to increase the material’s resistance to electrical currents, by spreading out the graphene nanoplatelets. 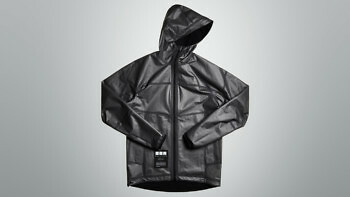 This first edition of the Graphene Jacket still conducts electricity, but at a far lower and safe level. Graphene conducts heat better than any material on Earth. So when you’re wearing the jacket with the graphene side next to your body in cold weather it helps equalise your skin temperature by sending heat from the hot bits of your body like your head, to the cold bits like your hands. It’s the first wave of conductive fabrics that will carry heat or electricity around your body but without any power source. Lab tests have shown that the closer to your body the material is, the more effective it will be at regulating your skin temperature and increasing it by an average of 2°C. Getting graphene into clothing is the start of a journey likely to last thousands of years. It sits alongside cavemen putting on animal skins and humans cultivating cotton. Until now the challenge has been how to get graphene out of research labs and into the real world. So making a material that can conduct heat and power is the first, early stepping stone towards bionic clothing that works like a platform to support other innovations. In 2014 physicists at the Max Planck Institute revealed that graphene challenges the fundamental laws of heat conduction. While the amount of heat a material can conduct was believed to stay constant whatever size or shape it was, the conductivity of graphene increases the more graphene there is, which means that it can theoretically absorb an unlimited amount of heat. But as the nylon base material has a melting point of 200–300°C, this should be tested carefully. You can heat the jacket up by leaving it out in the sun or over a radiator with the graphene side exposed to the heat source. If you then turn it inside out and wear the graphene next to your skin it acts like a radiator, retaining its heat and spreading it around your body. The effect can be visibly demonstrated by placing your hand on the fabric, taking it away and then shooting the jacket with a thermal imaging camera. The heat of the hand print stays long after the hand has left. While wearing the graphene next to your body will keep you warmer by increasing your skin temperature, it will also create less humidity next to your body than a normal membrane. In lab tests the humidity was consistently lower during every phase of exercise and recovery, so you should feel less hot and sweaty. It’s believed that the graphene is somehow able to disperse the extra humidity from the heat, but the ‘how’ remains unknown for now. Graphene’s tight atomic bonds make it impermeable to nearly all gases and liquids. But water molecules are the one exception. 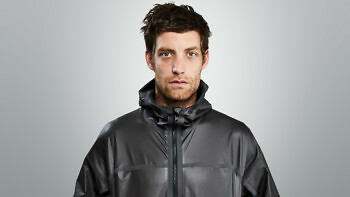 Which means we’ve been able to make the jacket both breathable and waterproof. As you sweat it’s able to evaporate out through graphene. And at the same time the polyurethane membrane makes it waterproof to 10,000mm. For the best combination of waterproofness and breathability, wearing it with the graphene on the inside produces the best test results. Graphene is super strong. But the jacket isn’t bulletproof yet. As it’s only a single atom thick, graphene increases the strength of the jacket in all abrasion and puncture tests, and it does it without adding a single gram of weight. But as much as we want it to be, it’s not bulletproof yet. Theoretically you need 10 layers of graphene to stop a bullet and the tech isn’t there yet. When it is, we’ll be the first trying to make a lightweight suit of extreme sports armour. In the meantime we’ll take the strength benefits of a single graphene layer of this early stage technology. 42 years after it launched, The Apple 1 computer looks like something from the 19th century. 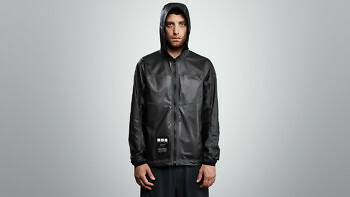 But every piece of technology has to start somewhere, and the first edition of the Graphene Jacket is no different. In tech you can either be late or early. To be late you’d stay in the lab for the next decade until you’d perfected lightweight armour. To be early, you’d put an experimental prototype out into the world and use the collective testing power of early adopters to improve and iterate. We went for option two. 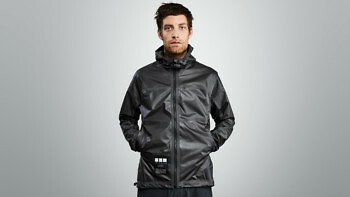 While the graphene membrane has a slightly rubberised feel, the black side of the jacket is soft and smooth. 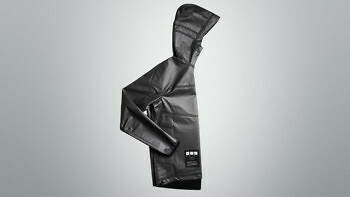 It’s made from a lightweight Italian-made matt black nylon that’s strong, windproof, lightweight and mixed with 15% elastane so that every part of the jacket stretches. 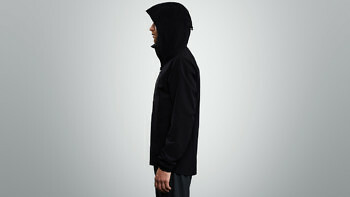 With welded eyelets under the arms, laser cut and bonded cuffs, elastic drawcords on the hood and waist and articulated sleeves designed for training, the fit is more like a lightweight running jacket than a ski shell. When you train you sweat. This sweat impregnates your clothes and contains bacteria that quickly makes your clothes smell. Unlike normal clothing, graphene is inherently bacteriostatic, which means bacteria can’t grow or reproduce on its surface and the jacket won’t smell like your normal kit. As well as being bacteriostatic, the graphene membrane is also known to be hypoallergenic and anti-static, and is certified as non-toxic. 14 years after its discovery, graphene remains extremely difficult to work with, incredibly expensive to produce, and very hard to make in large quantities. And while it’s been around since the beginning of time, it’s only a few billion years later that we can even think about designing materials with it. But like any new technology the industry around it will only mature over the next 10 to 100 years. 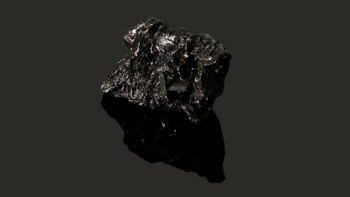 Silicon was discovered by a Swedish chemist in 1824, but it took nearly a century before silicon semiconductors paved the way for the rise of computers. Our view is that wearable technology will become increasingly invisible over the next 10 to 20 years. Instead of wearing it over your eyes or on your wrist, it will be embedded as clothing and tech simply merge. Graphene’s ability to conduct heat and power and withstand insane forces, while adding zero mass, should make it central to the story. It’s a supermaterial with the same potential to change life on Earth as stone, bronze and iron once did. The earlier we start the journey, the faster we get to the future.